Pictured above: The new Tozai Line in Sendai, Japan uses SkyTrain technology – and is opening in just 7 days. This is misleading and untrue, and I have proven this many times in my research and advocacy efforts throughout the past few years. The world’s longest automated metro systems are in major global cities including Dubai, Singapore, Paris and Tokyo, among others. The former (automatic train control) has become the global standard in rapid transit, with more than 1 in 4 cities now having at least one automated metro line as part of their system, according to the Automated Metros Observatory. There are 732km of automated metro lines, and the observatory expects this to triple in the next 10 years. I can imagine that the latter (LIM propulsion) has become the popular subject of contention – since only 5 systems have been built if you only count the systems installed by Bombardier. However, if you count all of the other systems offered by other companies, LIM technology is now used in over 20 systems in cities around the world, including many busy, large-scale systems in China and in Japan. I took this photo when I was visiting Osaka in March of this year. Look, a reaction rail!!! The biggest thing we misunderstand is that we think Bombardier is the “owner” of LIM technology and is the only manufacturer and provider of LIM cars. This is false. In the city of Guangzhou, China, the world’s largest linear motor train system has over 100km of track. Already, three train lines in the city are using the technology and are responsible for carrying hundreds of thousands of passengers each day. These are some of the newest subway lines that have been built in the city. One of them, line 6, opened just 2 years ago and is now the busiest line in the whole city. The 3 Guangzhou metro lines use cars that were jointly manufactured by ITOCHU and CSR-Sifang. Meanwhile, in some of Japan’s biggest cities, Kawasaki Heavy Industries has manufactured LIM transit cars for systems serving hundreds of thousands of passengers a day in Kobe, Osaka and Tokyo. Brand new linear motor trains on Tokyo’s Oedo Subway line were made by a different manufacturer than the one that made the first-generation cars. Kawasaki isn’t the only Japanese manufacturer of LIM cars. The upcoming system in Sendai is being supplied by Kinki Sharyo, and the Fukuoka system was supplied by Hitachi. The Oedo subway line in Tokyo, one of the busiest lines in the city, is using several different manufacturers’ offerings: the first generation cars were manufactured by Nippon Sharyo and Hitachi, while new-generation cars delivered just this year were made by Kawasaki Heavy Industries. Tokyo’s example is proving that more than one manufacturer can be the supplier of linear motor trains. These companies aren’t unaware of each others’ presence and do work with (and compete with) each other. They have even collaborated on certain occasions (as an example, Bombardier supplied bogies for some of Guangzhou’s metro cars – while Mitsubishi supplied the actual linear motors). These cities chose SkyTrain technology for various reasons, one of the most popular reasons being the reduction in tunnel sizes and – as a result – the reduction in capital costs for building the system. In Japan, SkyTrain technology systems are directly promoted as a way of saving money. New systems are being announced and built very often, speaking to the success of this technology. The systems are responsible for moving many more people than even SkyTrain does – and do so reliably, every single day. The newest system is opening in just 7 days in Sendai, Japan. I am looking forward to the launch celebrations. Above: A promotional video for Sendai’s upcoming Tozai Line, showing the use of SkyTrain technology. The Tozai Line opens on December 6. Last month we were greeted by the arrival of the first “Mark III” SkyTrain vehicles. Bombardier’s Innovia Metro 300 product is the newest generation of Bombardier’s offering of SkyTrain technology. It has won orders here in Vancouver, for an expansion in Kuala Lumpur, Malaysia and – of all places – for a new rapid transit line in Riyadh, Saudi Arabia. The renaming of what was previously called “ART” (Advanced Rapid Transit) into a “Metro” class product shows that Bombardier is as committed to keeping up with the development of linear motor propulsion technology, as its competitors are in China and Japan. But what about all the breakdowns? I’ve been feeling that SkyTrain technology critics would be motivated to speak as such due to the intensity of the recent SkyTrain breakdowns. For this, it’s important to get some perspective – particularly on what’s been causing some of these incidents to occur. Many of the recent break-downs on SkyTrain have been made worse by a particular shortfall that was identified in the commissioned SkyTrain performance review. In the 1990s, BC Transit decided not to add a simple component to the automatic train control system which would have allowed the system to recover more quickly when a train is stalled. Other driverless transit systems have installed this component and thus do not face this particular problem. The SELTRAC technology of the 1980s has been upgraded with new control and software elements. SkyTrain was upgraded to the 2nd generation of the SELTRAC technology in 1994. However, SkyTrain did not include the auto-restart module that was available. Therefore, in a temporary loss of communication from the VCCs or VOBCs, SkyTrain SELTRAC technology still requires each train to be manually introduced into the control computer system. Averaging 5-10 minutes per train to enter the necessary data, this equates to approximately 5 hours to fully recover operations, as there are approximately 40-58 trains operating depending upon when a service delay related to a train control communication failure occurs. TransLink has identified the addition of this system as an immediate priority, but it may not be happening for another 5 years as the installation is a complex undertaking. If BC Transit installed it 21 years ago, it would have been in place before the Millennium Line was built and we would be saving a lot of time with recent issues. Other breakdowns simply amounted to – in the case of last week’s incident – misplacement; – in the case of one of the 2014 breakdowns – human error; or – in the case of both the recent birds nest fire and tree hitting train incident – sheer bad luck. Perhaps some of these breakdowns have resulted from the particulars of how our system was designed. Regardless, any transit system is prone to a breakdown of some sort. There are many different reasons. My last blog post (We can learn from Japan on transit delays/incidents) was about a similar transit mishap in Japan last week on the JR Kobe Line, due to a fallen power pole. This is a conventional electric train line with rotary motors. And, it seems no one knew about this but on the same day (and at the same time) as the SkyTrain breakdown of this week, Seattle’s LINK Light Rail line faced a 3 hour closure and disruption, when a pedestrian was struck by a train on an at-grade section. What about the Scarborough RT? You definitely can’t excuse the fact that Toronto wants to shut down the Scarborough RT, one of the first SkyTrain lines built and in-service, and replace it with either an extension of the Eglinton Crosstown LRT on the same route – or an extension of the Bloor-Danforth Subway line. However, I reckon that the conversion and replacement has more to do with the desire to provide a through service with these other lines and reduce transfers. From a transportation planning perspective, that’s a very natural thing to want to have. It’s part of why the City of Vancouver has preferred that the “Broadway Subway” be built as an extension of the existing Millennium Line and not in any other way. However, it’s also importance to have some perspective. The Scarborough RT was the first SkyTrain-technology line ever built, and was converted from what was supposed to be a standard extension of the Toronto streetcar system. The system was built to run only shorter Mark I cars, with newer Mark II cars deemed incompatible without a refurbishment. The Scarborough RT was built well before a “Mark II” train car was even considered as part of the design. This refurbishment was in fact studied, and was valued at $360 million. Going with a refurbishment was considered one of the most cost-effective ways to improve transit to Scarborough. The existing line and stations would be rebuilt to accommodate newer Mark IIs and Mark IIIs, and so provide a better service. It would have cost less than rebuilding the line as an LRT system to integrate with the Crosstown line, and far less than building a new subway. It would have also avoided 28 additional months of transit service disruption for riders in Scarborough. In addition, the Scarborough RT is run with drivers who operate the doors – breaking the fully-driverless design standard to which it was built to. As Toronto has not seen the full benefits of running ALRT the way it was designed, it’s hard to consider today’s judgement of replacing/shutting down the RT fair or unbiased. 2 years ago, Michael Schabas, a UK-based railway consultant of the Neptis Foundation, published an excellent report hypothesizing that the acceptance of SkyTrain technology in Greater Toronto could have saved billions of dollars and prevented a lot of the choking debate that’s put transit expansion there at a standstill today. Reports and viewpoints like these provide great insight and in my view are worth serious consideration. We all lose when someone is dismissive to consider really great alternatives, and ignores facts when there are facts at hand. Share this article on Twitter, Facebook and with anyone you know who’s concerned on transit matters. I believe that regional transit planning has been damaged significantly by misinformation like this, and it’s time to put it to an end for good. I urge everyone reading this to help me spread the word and help me pressure Global into allowing me to respond to their article. So I thought I’d put up a newsletter that the Langley Times published today, along with some added sources/notes. For anyone that’s curious, I intend to be doing some more blogging on the BCER Interurban very shortly. We should welcome good transit ideas here in Langley, but there’s a reason that TramTrain isn’t one of them. TramTrain was possible in Karlsruhe because it’s surrounded by numerous electrified regional railways. We don’t actually have that here in Vancouver; and while the BCER Interurban may seem like a tempting choice, it ran three times a day  and wasn’t built to service today’s cities . When the province and TransLink conducted the Surrey Rapid Transit Study, the Interurban was denied because it would cost millions to retrofit yet still fall short on providing useful connections and service frequency . In other words, it would be a giant waste of money. What we do have are numerous fast highways on which we could operate inexpensive rapid buses. One of those, the Trans-Canada, now has the Fraser Valley Express (FVX) service from Carvolth Exchange to Chilliwack. This service is now providing the alternative that valley commuters asked for — but when it came time to consult locals about the FVX, Rail for the Valley did not participate . That’s because Rail for the Valley’s TramTrain and LRT advocacy doesn’t come from a genuine desire to make transit better — but rather an opposition to extending SkyTrain to Langley, even though it will do the most for transit commuters. Our SkyTrain system boasts a ridership that is higher than any LRT system in Canada and the US. That’s why over 50 cities worldwide have followed our lead by successfully employing ALRT-style driverless metros . As an extension of an existing system, SkyTrain would have the lowest addition in annual operating costs . Without transfers, commuters starting at Langley Centre Station could reach Waterfront Station within 60 minutes . That’s the kind of travel time improvement that’ll get people really wanting to use public transit, and generate the fare revenue to recoup costs. I’m all for good transit ideas; but when it comes to what will objectively serve Surrey and Langley best, rapid buses and SkyTrain are the way to go. The BC Transit Public Engagement Reports for the Fraser Valley Express, Abbotsford-Mission (CFVT) Transit Future Plan and the Abbotsford-Mission (CFVT) Efficiency Review indicate that there has been no participation by members of Rail for the Valley and other associated initiatives, with no comments on potential Interurban Rail service. The Automated Metro Observatory regularly reports on the worldwide progress of driverless transit systems. There is an expectation that the amount of fully driver-less metro systems will triple by the year 2025. 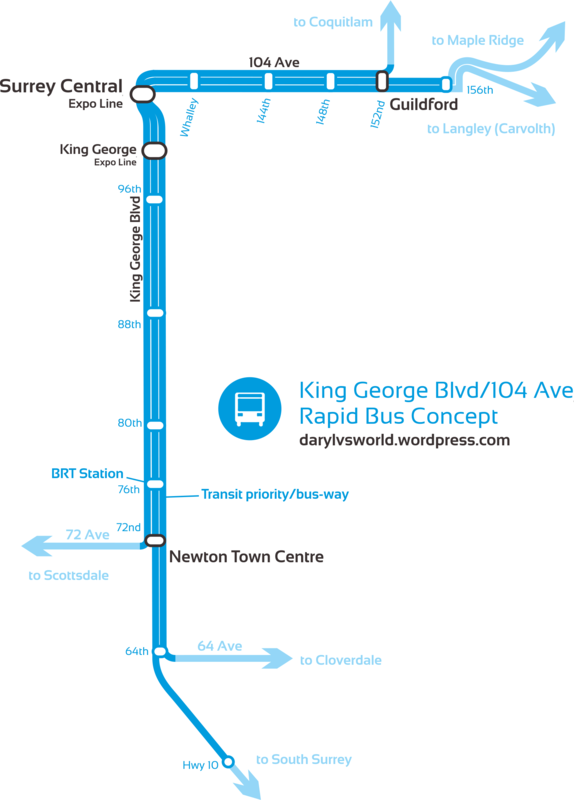 Based on Surrey Rapid Transit Study travel time estimates.